Railpictures.ca - Stephen M. Scalzo photo, Dan Dell'Unto coll. Photo: A group of kids out for an afternoon stroll cross Mount Pleasant Avenue in front of waiting traffic and TTC PCC streetcar 4506, which has just departed Eglinton Loop on the lengthy St. Clair route heading southbound. After going south on Mount Pleasant to St. Clair Ave., 4506 will then turn and head west across St. Clair, stop at the namesake subway station loop at Yonge Street, and continue on west again to Keele Loop in West Toronto. This was a few years before the eastern portion of the St. Clair route serving Mount Pleasant was split off into its own streetcar route (only to end in mid-1976). The A-8 class of PCC streetcars (4500-4549) were the TTC’s final order for newly-built PCC’s, purchased in 1951 and operated on routes out of St. Clair Carhouse (aka Wychwood) for much of their lives. 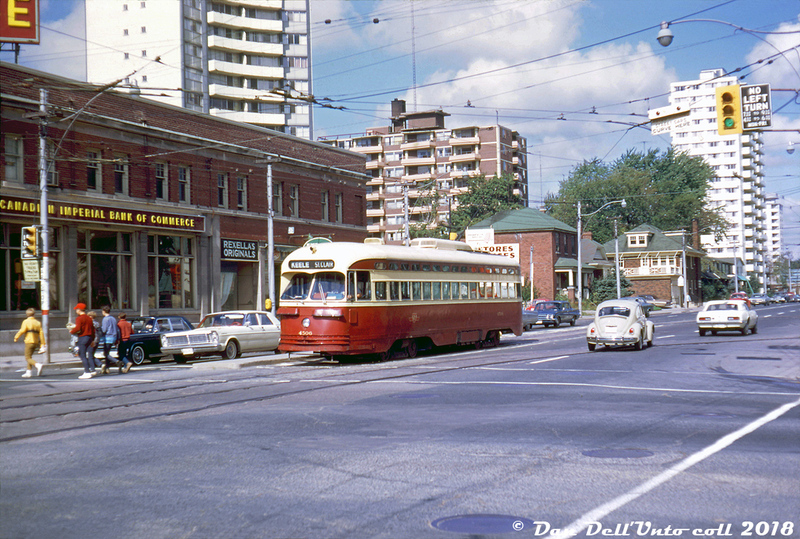 Today streetcars have been long gone from Mount Pleasant, and service is provided by TTC’s route 74 bus (reaching all the way to the top of Mount Pleasant at Doncliffe Loop). Stephen M. Scalzo photo, slide from the Dan Dell’Unto collection. | Railpictures.ca – Canadian Railway Photography – photographie ferroviaire Canadienne. Copyright Notice: This image ©Stephen M. Scalzo photo, Dan Dell'Unto coll. all rights reserved. Caption: A group of kids out for an afternoon stroll cross Mount Pleasant Avenue in front of waiting traffic and TTC PCC streetcar 4506, which has just departed Eglinton Loop on the lengthy St. Clair route heading southbound. After going south on Mount Pleasant to St. Clair Ave., 4506 will then turn and head west across St. Clair, stop at the namesake subway station loop at Yonge Street, and continue on west again to Keele Loop in West Toronto. This was a few years before the eastern portion of the St. Clair route serving Mount Pleasant was split off into its own streetcar route (only to end in mid-1976). The A-8 class of PCC streetcars (4500-4549) were the TTC's final order for newly-built PCC's, purchased in 1951 and operated on routes out of St. Clair Carhouse (aka Wychwood) for much of their lives. Today streetcars have been long gone from Mount Pleasant, and service is provided by TTC's route 74 bus (reaching all the way to the top of Mount Pleasant at Doncliffe Loop). Stephen M. Scalzo photo, slide from the Dan Dell'Unto collection.